Here is another practical (but now quite old) example: It's a "propensity to buy" model for a financial product for a famous French bank. For this project, we had the opportunity to compare our new "ranking" (obtained with an ancestor of TIMi) with the ranking that was previously obtained by another consulting company working for the same famous French bank. As you can see, the TIMi predictive model has a totally different and better accuracy than the previous predictive model (on the above chart, the lift of the new TIMi model is really higher). This improvement was easy to obtain because the old predictive model was created using a segmentation technique (with a tool similar to SPAD that is mainly built for segmentation analysis). 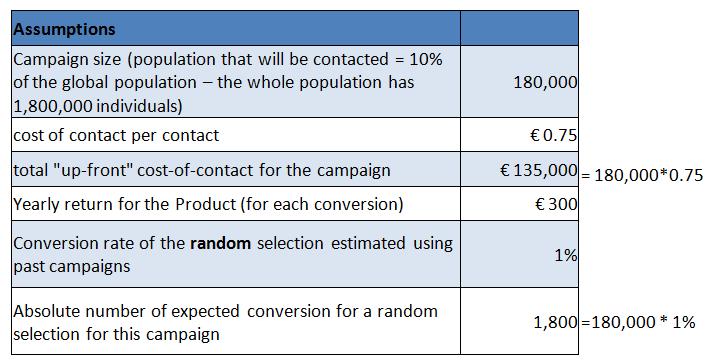 As you can see, segmentation techniques should NEVER be used to create "Propensity to buy Model", "Probability of Default model" or "Churn Prediction model" (or any model with a clear "target"). Segmentation technique should only be used to "segment" your customer base to create different communications text or media for each channel (for example: you don't speak in the same way with a young person than with an old person). The "TIMi suite" also includes a powerful segmentation tool (named "Stardust") but this technology should not be used for targeting/predictive/ranking applications. As you can see, higher accuracy means substantially more ROI out of your marketing campaign. All other datamining vendors are hiding you this plain and simple fact! I encourage you to read this paper : comparison_ROI_IBM_TIMi.pdf ... that explains in more details how higher accuracy means higher ROI. The accuracy of the generated predictive models. One last very important criteria is "scalability" but it usually comes "hand-to-hand" with accuracy, so I didn't bother listing it here above. Indeed Datamining tools that are not able to "digest" large databases will systematically resort to a technique named "sampling" that reduces substantially the accuracy of your predictive models. TIMi is significantly superior to all other solutions on these 3 topics (accuracy, insight, scalability).